Welcome to the E.S.W.Z.V. Nayade website. Nayade is originated from the Eindhovense Student Corps. The current name of Nayade is founded of 1996 and it stands for Eindhoven student waterpolo and swimming association. At this moment we have 4 different waterpolo teams, and there are several students just training at the club. The matches are mainly played in the weekends on Saturday afternoons. Every year the teams also participate in some (inter)national tournaments. • The 1st team (‘t vlaggenschip) plays at the third class of the Dutch swimming federation. • The 2nd team plays at the lower 2nd class of the fifth waterpolo district of the Netherlands. And there are also two ladies teams. • The 1st lady’s team plays at the 1st class of the fifth district. At the moment there are about 80 active swimming members. These are evenly divided between the technique and competition group. At the technique group everyone is welcome who want to learn how to swim in a competition. In the competition group the more experienced swimmers are present. In the swimming department of Nayade all levels are represented, from absolute beginner to National championship participant. All of the trainings are given by experienced trainers and will be thaught in English. * Inexperienced waterpolo Men are advised to train during the Lady’s hours. 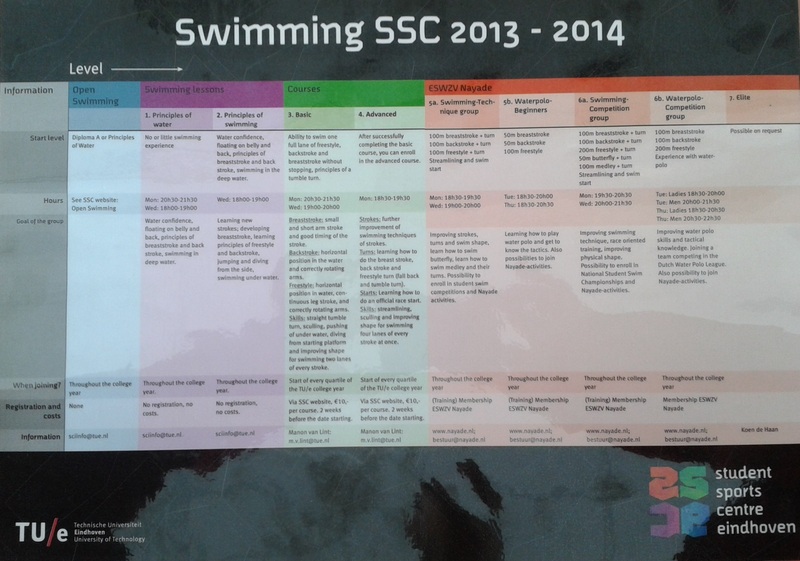 If You’re not sure witch swimming group fit’s you the best, here the SSCE schedule. Next to the sports relaxing is also important. And that is why there are several activities organized by committees during the year. Examples are the Sailing-weekend, the beer-tasting, eating relay and club championships. The main activity is the International Nayade Waterpolotournament, this is the main student waterpolo tournament of the Netherlands and is also open for non students. In this student residence 11 active members are living together, and every year they throw a spectacular house party. I am a new masters student at TU/e. I want to learn swimming. Can you help me with more information about the fees & timing?